November 30, 2009 - British Airways, in an agreement with the U.S. Department of Transportation’s Aviation Enforcement Office, will compensate consumers for cancellation penalties and other expenses incurred due to the carrier’s erroneous offer of $40 fares between the United States and India. The lowest U.S.-India fare being offered by British Airways prior to the mistaken ad, not including taxes, was over $750. The $40 fare, which did not includes taxes and fees, was posted on British Airways’ own website at about 6:30 pm on Oct. 2. The carrier realized its error nearly immediately and removed the fare within minutes from its own website, but it remained on the websites of certain on-line travel agents for about two hours. During this time, more than 1,200 bookings were made covering approximately 2,200 passengers. In consultation with the Aviation Enforcement Office, British Airways also has agreed to reimburse passengers for their expenses resulting from having relied on the erroneous $40 fare. These could include fees for cancelling flights or cancelling hotels, rental cars or other ground arrangements, as well as additional costs incurred in rebooking flights due to fare increases on previously held flights that were cancelled in order to book the $40 fare. Below is a statement from British Airways all consumers who booked flights between the U.S. and India on October 2, 2009. British Airways sincerely apologizes to all our customers who booked flights between the U.S. and India on October 2, 2009, and were subsequently notified that their booking had been cancelled because of an inadvertent pricing error. British Airways wishes to make sure that the inconvenience you have suffered is appropriately recognized and that you are properly compensated for any financial loss you may have incurred as a consequence of relying on your cancelled British Airways booking. As you were advised by email shortly after cancellation, British Airways, as a gesture of goodwill, offers each cancelled passenger an opportunity to book any one retail World Traveller fare from the U.S. to India at a $300 discount. This offer is available until midnight December 3, 2009 (EST). Tickets purchased under this offer also must be for travel completed by September 30, 2010 and be for the passenger whose booking was cancelled. If you also believe that you have incurred a financial loss as a result of cancellation you should contact British Airways Customer Relations. British Airways is prepared to reimburse you for penalties imposed by an airline or ground service provider as a result of your cancellation of air or ground arrangements in reliance on your cancelled British Airways booking. British Airways will also reimburse those passengers who necessarily incurred added air fare costs in restoring a pre-existing booking or reservation from the United States to India if that booking or reservation was abandoned as a result of making the cancelled booking on British Airways. Further, if you have incurred any other out-of-pocket expense, British Airways Customer Relations will make appropriate reimbursement to you in circumstances where the losses were caused by reasonable reliance on a British Airways flight booked between the U.S. and India on October 2, 2009 and its subsequent cancellation. 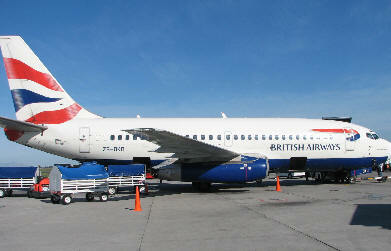 British Airways will also assist you in properly documenting your claim so that it can be processed in short order. Please note that these offers apply only to customers whose bookings were cancelled as a result of our pricing error. Once again, we sincerely regret this error and any inconvenience it may have caused you. We hope to see you on board again soon.